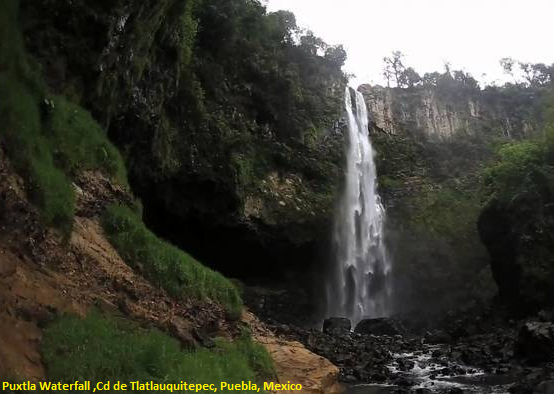 The Puxtla waterfall, also known as "la del siete" due to its location at Km. 7 of the Tlatlauquitepec-Mazatepec highway. It has an impressive fall of approximately 70 meters with two waterfalls of about 40 meters high. In the place you can see the beautiful vegetation, with an almost virgin landscape and previously, the waterfall housed a dam that served as a generator of ecological electricity, belonging to the state project of Atexcaco. To get from Puebla to Tlatlauquitepec you must use Highway 129. Arriving there take the road to Yaonahuac. You will pass a petrol station where you have to turn left (where there are several restaurants), after a small bridge (if you arrive at the town of Yoanahuac it means that you passed by what you must return to the bridge), turn left towards the town of Puxtla. After 1.5 km. from dirt road you arrive at the river bank where you can leave your car, to go on foot to see the waterfall.